Rumkommen - Travel Reports - Au revoir y hola! I spent six weeks in the beautiful Saurat valley at family Stoelker. To earn my stay in the comfy room and three scrumptious meals per day, they had different jobs for me. Deborah and Jon are from England and have been living in Bedeilhac for eight years. They bought a property that contained a "gîte" to rent out, a house to live in and some nice green land with loads of Acacia trees. It is situated at the north facing side of the astonishing (especially for climbers) mountain Calamès. Debs proposes the first big project I could try to do: In the past the family had pigs and chickens behind their house. Unfortunately, after the animals had left, the area turned into a paradise for nettles and Acacia trees. So the question is, how to use this place in the future? Her first idea is to make a little camping area and a dry toilet. That means compost... I love compost since I built my first two-bin system in Scotland! So, of course I want to do it! There is just enough space for a big 5-person tent but it should be enough to start with. Next step is to level the ground for the compost toilet. What would I do without the pick-axe, shovel and some heavy metal music? Jon brought a few old palettes from the building sites, where he is working at the moment. I use one of them for the ground and take the others apart, to make slats for the walls. The two sons Dylan (9) and Nathan (8) are being brought up bilingually. Nathan has got a kind of autism. His parents tell me, that it has been extremely hard for all of them in the first years, but now they found a good way of leading a healthy life together. Nathan can even go to a normal school. An assistant is helping him there every now and again. Nathan and Dylan are both super kind and funny. And they are huge Lego fans. One day they ask me if I could show them how to make a Lego film. Of course I can, since I have spent three years of my childhood together with my cousin creating a Lego film. Nathan helps a little to develop the unbelievably profound story line and the whole family provides their voices (or better shouts) for the sound effects. Dylan is really patient and brings the small Lego figures to life together with me. My French skills are still kind of non-existent, but I have a great time in the Pyrenees at the Stoelker's house. Jon is a climber and hooks me up with some of his climbing buddies. On my days off I usually touch some crags and enjoy the gorgeous views. It is amazing here. I learn a lot of new climbing skills and get to see some different rocks, too. Because in Saxony, where I learned climbing, you can only find very brittle sandstone. Here are limestone and really hard granite and the routes are very well secured. I am in Bedeilhac and spent the night in the big tent on my lovely leveled piece of ground. At 8 o'clock I go down t the house for breakfast, because Jon has already got to leave to work and I want to say goodbye to him. It was just such a great time here and I have the feeling that we all enjoyed the six weeks together and that both of them were happy with my work and presence. Jon gives me a hug, thanks me for my efforts, says that he is sorry there were no more interesting projects like the dry toilet to work on, and hands me a fifty Euros bill. He would have treated me to a train ticket to Andorra but since I only want to hitchhike, I should se the money for something else like food. I am touched by these nice words. Then I pack my things and have lunch later on together with Debs, Liz (Jon's mum), Dylan and Nathan. Debs made me baguette with mushrooms, eggs and cheese for the long journey - yummy! I say goodbye to everyone and leave the house with Nathan's words shouting in my direction: "Thank you for doing the Lego film with Dylan!" I have met Cathy O'Dowd while climbing in the Ariège. She invites me to her home in Andorra for a few days to show me some crags and via ferratas in her area. After 15 minutes of waiting a white van stops. Two women sit in the front and open the back of the car. A girl of my age makes some room on the rear seat. It turns out that she is the daughter of the only German, that I met in the Saurat-Tal: Hubert makes fancy spatulas out of wood and sells them on local markets. So we only speak German until Tarascon. In Tarascon I wait for quite a while and change the spot. In a lay-by there's a parking car and I stand behind it with my sign showing to the other side. Since no one stops, Sergio reverses his car and waves me in. He is on his way to the street festival in Tarrega and wants to sell beer there. He grew up in the Spanish Pyrenees, speaks Katalan, Spanish, French and has done all kind of jobs from working in a hotel and gardening to being a ski instructor. But his passion is making puppets. He drops me off in Andorra la Vella and gives me a short demonstration. The puppets are made of foam, so they can perfectly display emotions. We are laughing our guts out on the busy streets and speak to the people with the puppets to make them laugh, too. So funny! I walk through the streets, passing by a sauna which looks like a giant church made of glass, chat with a few salesmen and hike up a hill until someone takes me a little bit in his car. From here on it's only 2km afoot to Cathy's house. She has sent me a few photos how to get to the house and where she hid the key, so I could already enter and wait until she comes back from her day out on the rock. Her cat Cleo lets me in and I buy a Falafel from Jon's money. Cathy has got a strong personality, but at the same time she is very kind and helpful. I can sleep in a comfortable room and have my own bathroom! She also offers me a plan for tomorrow: doing a via ferrata together with her and after that a 3-4 hours walk. She hands me the map straightaway. Everything is done pretty quickly. That's how I like it. Not too many much hassling around with exaggerated politeness. Here's the plan and on we go! While Cathy is having her dinner she tells me a few stories about her unbelievable mountain adventures. For example, she was the first South African woman climbing Mt. Everest. And then she went up a few years later from the other side as well. Then she supported a team who was going for the first ascent on a new route up the Nanga parbat (8125m) in Pakistan: they had food for ten days in their backpacks. On day eleven Cathy and another woman turned around to the last camp, because it was still two days to get back there. The couple that led the expedition went on. After 14 days they reach the summit and need another four days to get down. That means eight days without food and a coupe of frozen toes. But they said it was worth it. We get up at 7 am, because we want to get the via ferrata "Roc del Quer" as soon as possible. The descent from the parking place takes about 20 minutes and is quite steep. Given the tempo Cathy is rushing down the hill, my legs start to feel weak already. Reaching the start of the route there are 350 meters to climb up. It's quite safe if you use the security line but still a non-fall-sport, because you could get hurt badly. The sun is not too strong yet and we get rewarded with a beautiful view from the crag. Since it is a via ferrata with the grade "difícil", there are actually a few nice overhanging bits. I should do that with my dad, when I meet him in Barcelona! After that, Cathy drops me off at the start of a walk to Casamanya. To reach the summit (2740 m) I need to climb an altitude of 700-800 m on the south facing side of the mountain. With the blazing sun, wobbly legs and sweating feet in my hiking boots. But anyway, I make it to the top in 1,5 hours. Cathy said that in winter she likes to go up the mountain on skis. Oh well... I take a long rest, enjoy the amazing view and fresh breeze. Descending the mountain takes a bit longer and leads through an idyllic path through the forest, ending in the pretty village "Ordino". Before I go to Spain, Cathy suggests to do one more via ferrata and after that she could take me to the border. I am getting a bit nervous about hitchhiking in Spain, because of all the other travelers telling me that Spanish people just won't stop for you anymore. So I stand on a lay-by for 2,5 hours and the first guys who stop are a few youngsters on their way to the festival in Tarrega. So I made it halfway to Barcelona. I don't even have to wait five minutes, until a Cuban couple waves me in their car and drops me off right in the centre of Barcelona. On our way we pass the astonishing Mountains of Montserrat. I'm going to have a closer look at them later on. After 15 months of traveling it's the first time to see my family again. What a great feeling. Since my birthday is in September, my dad suggested to meet me in Barcelona and spend one week there together. He rented an AirBnB apartment in the district La Gracia. I have my own room with a big bed, access to the balcony and a wardrobe! (Wardrobes and shelves are one of the best inventions ever. You can store and sort all your stuff in there without having to dig in a big backpack... Amazing, isn't it?) Finally I can explore a big city without having to think: Where will I stay tonight? Which museums are for free? Where can I get cheap food? Usually these questions bore me the whole day... Here I can ignore all this and enjoy being with a dad who likes to be a proper tourist from time to time. We take our time wandering through the streets, visiting Gaudí's buildings and choosing the right tapas bars. Everything is so relaxing. One day we meet the two Czech sisters Petra and Šárka. They meet a friend who lives near Montserrat. Since I proposed my dad to do a via ferrat there, we decide to go climbing there all together. The trip takes the whole day and turns out to be the best via ferrata I have done so far. It's great, that the city sightseeing is now complemented by a nice outdoor experience! Jordi offers a place to sleep in his house for travelers via Couchsurfing. He is a musician and lives in Vila-Real in the region of Valencia. When I ask him to spend two nights at his place he tells me that he'd love to host me but unfortunately won't be in Vila-Real on Saturday. Instead he will be in the small village Betxí. His friends are organizing a whole day with a gigging pick-up truck. 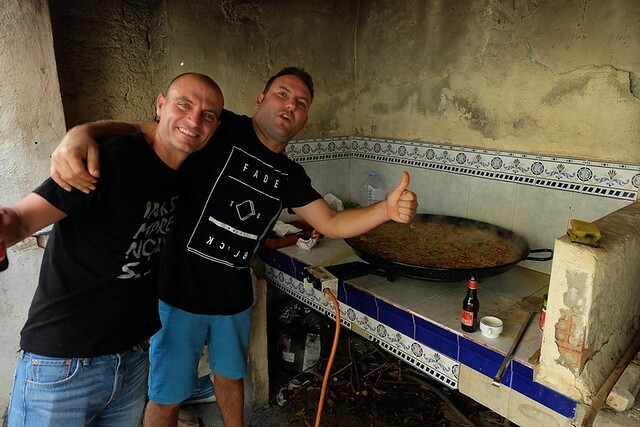 Two bands are using the back of the truck as a stage and play on the different peñas: the neighbours of each block of houses gather in one garage, are cooking several paellas, put tables in the front and celebrate the "festes del Cristo". Jordi says that I should just come to Betxí and have some fun with all of them. So I take a train out of Barcelona after saying goodbye to my dad. It's a weird feeling to be completely on my own after such a nice familiar atmosphere and it takes me a while to get used to being on the road again. Of course, the train is going in the wrong direction. I just wanted to get out of the urban area close to the motorway to start hitching a lift. But there are two ways to St. Vicenc de Calders. I took the wrong one. Well, what matters is that I'm out of the big city. It turns out to be quite easy to get from the town Vila-Nova to the motorway. Five cars give me a lift: father and son; a very old Spanish couple who drop me off at the motorway; mother and child; an Argentinian film producer; and a Cuban family who take me all the way to Betxí, although it's not on their way home. Jordi gives me a warm welcome with a bottle of beer and introduces me to the musicians and the neighbours of the first peña. They even make the effort to select only the vegetarian bits of the paella. In the beginning I'm a bit overwhelmed, because everyone is speaking Valenciano (which sounds the same as Catalan). But as soon as I explain, that I don't understand it, I can easily communicate on Spanish or better "Castellano". After the lunch they invite me to a local drink called carajillo: rum with coffee beans, sugar, cinnamon and lemon. Before drinking they light this mixture to caramelize the sugar. And the best carajillo in the village is made by a Romanian guy. I soon realize that alcohol and music are complementing each others this day. Now we get on the pick-up truck (la camioneta). Together with musicians, children, friends and neighbours we drive past the other peñas and get standing ovations from the tables. After a few rounds through the streets we stop at one peña. There is free beer for everyone and electricity for the band. "Los Altragos" are going first. Nearly all of the band members come from the village. The mainly cover rock songs from the 60ies and know how to entertain the audience. Jordi's band "Five Fingers with Parasol" are next on the camioneta and convince through an amazing groove (especially given the amount of beers being drunk) and a very amusing show wearing Hawaii shirts to match the surf music. At night (or better early in the morning) I drive to Vila-Real with Jordi and Oscar (his guitarist). The next day we meet Jordi's friend Juan in a café. He is becoming a photographer and wants to create a gallery of musicians. So he asks me if I want to be his first model. Why not? We meet one day later in a garage, where he installed a small photo studio. It's a really rexaling atmosphere and doesn't take long until he shot a few photos that he's happy with. He thanks me a thousand times for taking my time and trusting in his work. And I learned a new skill: to relax in front of the camera. Jordi says, that he couldn't do that. It's okay for him to sing in front of 5,000 people, but to be natural on a photo? No way, he'd be way too nervous! Now it's time to move again. I want to go to Andalusia! Jrodi recommends me to pass San Pedro on my way down. It's a hippie community at the beach cabo de gata. I could easily pitch my tent there and introduce myself as a new neighbour. He takes me to the motorway. Unfortunately there are hardly any cars stopping which go towards Almería. Two guys from Senegal take me to a service station near Valencia. Me and my backpack squeeze on the folded backseat on top of a scaffolding. They tell me really good stories about hitchhiking in their home country and drop me off at a service station. A French man offers me a lift to Murcia. The three hours pass by super quickly. We talk about his job in Spanish. He is a wholesaler for citrus fruits in Perpignan and it's really interesting to hear the opinion of such an insider about food waste. He insists on dropping me off at the last service station, even if it is behind the exit that has to take. Fortunately, just before the exit we can see the big signs "zona de servicio". A white Renault Kangoo with a Spanish number plate approaches the petrol station. The couple inside looks like Central European with an English Lonely Planet in their hands. Strange combination. I'm going to ask them where they are heading to. He is from the Netherlands and she is from Germany. Together with their small son (1.5 years) they want to go to a small village close to Las Negras; the place that I need to go to walk to San Pedro. We spend two hours together in the car and I get dropped off 3 km before Las Negras. The first car that I see stops immediately and the old Italian Don takes me into the village. San Pedro is kind of a strange place. It's situated in a wonderful bay in one of the driest regions of Spain. It can be several years without rain here. This fact seems to attract especially a lot of German "dropouts". I pitch my tent in the bushes just before the beach and explore the infrastructure. There are a few foot paths, springs and wholes in the ground (dry toilets). Up on the hill I can see an old castle ruin, which unfortunately is closed by the officials because of its risk of collapse. The beach is really nice and the water so warm. On the water I can see a sailboat anchoring. It's hard to say how many people are living in the huts, caves and tents but not many, that's for sure. And still, there are seven bars in San Pedro! Obviously, these bars need to be provided with beer. Since the next parking place is half an hour away on foot, they need people to carry the beer along the hilly coast. Together with the two German travelers Yannick and Samuel, I visit Franco's (yes, his name is not a joke) bar at night. He is from Bavaria and when he gets to know that the two boys have a car standing at the parking place that I mentioned earlier, he makes us an offer: Tomorrow we should empty our backpacks, walk to the car with his confidential person Matthias and drive to Las Negras. There we should buy 15 pallettes of beer and carry them down to his bar. In return we would get three euros per pallette and a discount of 50 cents for the beer sold in his bar. So we do it, just for the fun of it. Since it takes us two walks to carry the beer and do some more grocery shopping, it's already evening when we finally drink the first of the carried beers. Samuel, Yannick and me meet a few more Germans on the beach. They have heard from a bar, that is situated further in the mountains. It's not easy to find the way in the dark, because there are no real footpaths leading there, only dry river beds. But then we can make out guitar and flute sounds. That must be it! So, finally we meet some Spanish speaking people, who drink wine and make music together. Here I feel so much more comfortable, than at Franco's. It's a gorgeous last evening, before I shall head off to Andalusia.